2 large burgundy with white tip Dahlias cut 8"
some Plectranthus Coleoides (Swedish Ivy) from the garden (green & white leaves) cut 8 - 13"
It's late summer, early fall and it's the Labor Day weekend. It's still hot in LA, but we are beginning to see some cooler days. 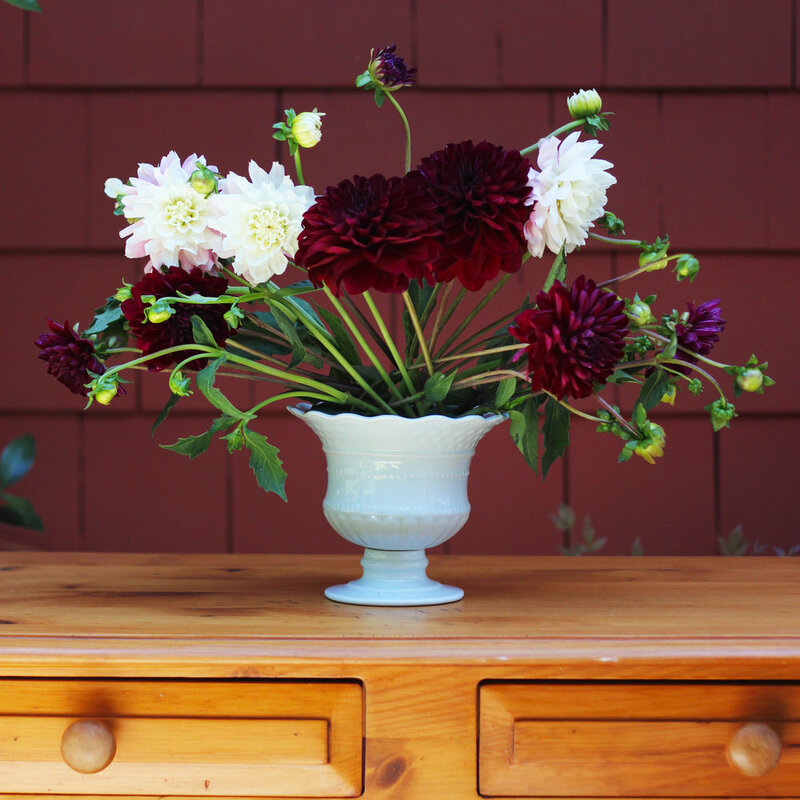 It is the perfect time to make a dahlia and rose flower arrangement. Dahlias are still in season. 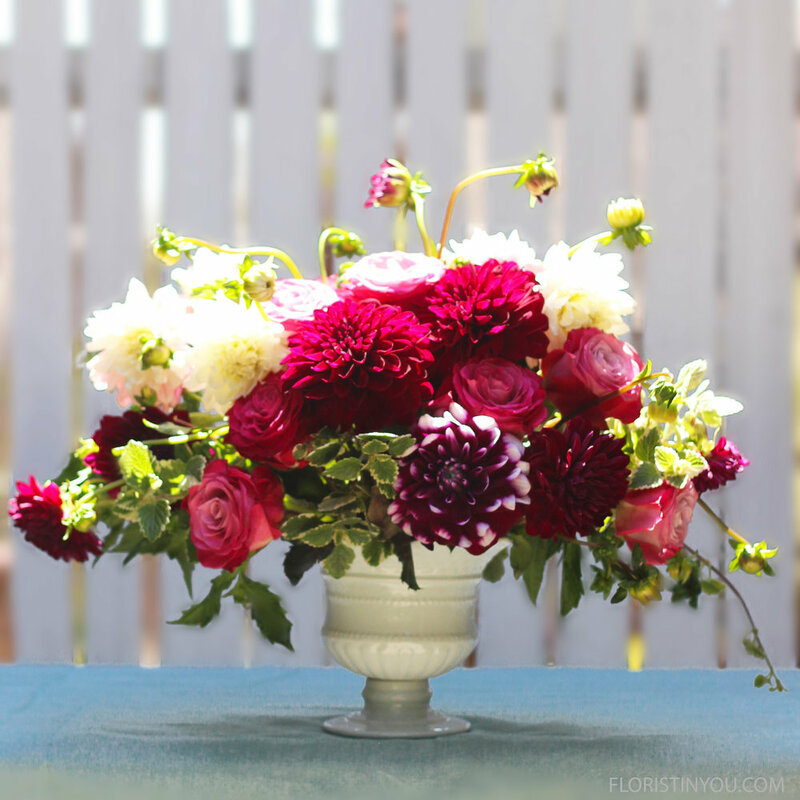 You may have to chase around to a few stores to find the right color combinations, but I tell you that dark burgundy dahlia is to die for and the pink and white dahlia has a splash of soft color that blends perfectly with it. Roses are everywhere in the stores and they are cheap. I found mine for $7.99 a dozen. Well, if you have your sea green vase, your dahlias, roses, floral foam and wire you are ready. Let's begin. Shape your floral foam with a produce knife so it will fit into the vase. The shape at the bottom will look like the bottom of a teacup. We're beginning. Cut stem to 12 inches and insert at an angle. Repeat on left side. Add pink and white stems cut 13 inches to both sides. Add anchor flower bottom right in front. Add half the roses to the front. Add Swedish Ivy 8 - 12 inches long to fill in. 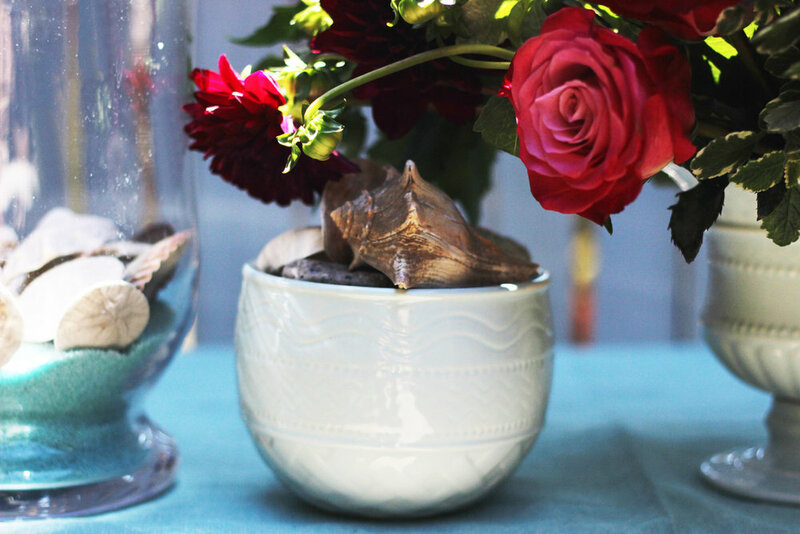 For a table setting, pair this with seashells and sea green sand in a hurricane lamp and a sea green table cloth. You can make summer last a little longer with these tokens from the sea. Enjoy this last breath of summer.